IF ANYONE thought being the host of radio comedy favourite I’m Sorry I Haven’t A Clue would make Jack Dee any cheerier, they’d be mistaken. The professional grump took over as the chairman of the long-running game show following former host Humphrey Lyttleton’s death in 2008 – but Dee still doesn’t seem that pleased to have landed the job. “I like to think that I’m Sorry I Haven’t A Clue is more sunny and optimistic these days and that it’s mainly down to me,” he deadpans. The format of the game is very simple: four players are given silly things to do by the Dee, with Colin Sell setting some of them to music. It has always been billed as ‘the antidote to panel games’, although the panel games to which it was originally a remedy are now long gone. Some of its best-known rounds include One Song To The Tune Of Another and the game called Mornington Crescent. Dee insists he prefers the longer rounds ‘as I can concentrate on my sudoku’, and says the only round he wants to join in with is ‘the one after the show, in the bar’. The star of recent hot TV shows such as BBC’s Josh and The Apprentice: You’re Fired is currently chairing I’m Sorry on tour. Joining the UK jaunt are regular panelists Tim Brooke-Taylor, Barry Cryer, Jeremy Hardy and Graeme Garden, although, Dee insists he is not overly fond of them either! Dee threatened to leave the show a couple of years ago when complaints about smutty jokes involving the show’s fictional scorekeeper, Samantha, led to national headlines. He says now: “Samantha made her position clear and helped us all to rise above it,” and he seems to at least tolerate his role with the show. 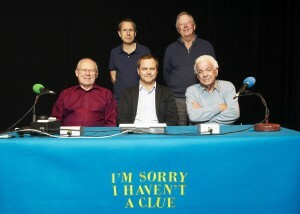 I’m Sorry I Haven’t A Clue comes to Woking’s New Victoria Theatre on Monday 8 February. Buy tickets from atgtickets.com.